A bright steel driving weight enclosed in a steel tube to allow safe operation in any conditions. A forward mounted capability. Postpunchers can be fitted to any tractor front-end loader, telehandler, skidsteer or back hoe. Postpunchers allows operators to drive posts in at angles of 45 degrees and upwards. Drives in posts up to 200mm (8 inches) Dia. It has a driving weight of l05kg and overall weight of 2l0kg (excluding frame). This is our most popular Postpuncher. It can be fitted to 2.5t mini excavators upward and frontloaders with the option of left and right tilt whether by manual tilt or hydraulic and remote tilt. We have designed the Postdriver as a cheaper alternative to the Postpuncher. The Postdriver was designed for the smallholder and compact tractor, but is also capable of being fitted to mini excavators and skidsteers. The postdriver has a driving weight of 80kg and has a slambox which incorporates a cage which encloses the driving weight. It has the capacity to knock in round posts up to 8 inches (200mm) or square posts up to 7 x 7 inches and has a pin that holds 5 x 3 posts from twisting while being driven. Other driving weights are available, also left and right tilt, forward and back tilt and can be manufactured to the customers requirements. The Fastfencer attatchment was designed for use on tractor 3 point linkage, frontloaders, excavators, skidsteers etc. lt has a hydraulically operated wire clamping system and can be manufactured to customers specifications l to 2 x 500m roll stock wire netting 1, 2, 3 x 250m rolls. 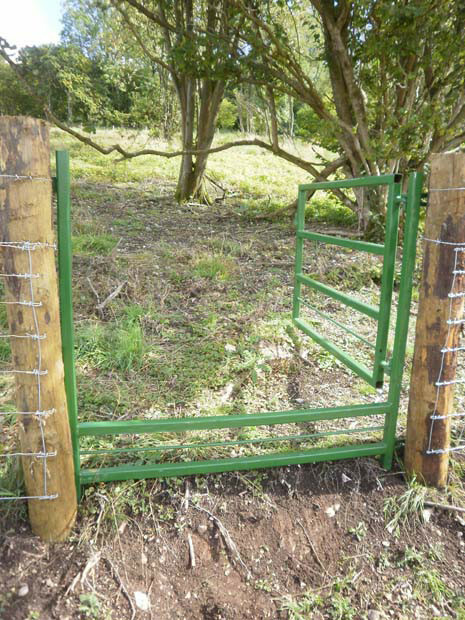 Double feed left and right so the operator can use the Fastfencer clockwise or anti-clockwise around the fence line. lt will handle big square wrapped bales by clamping the sides using a hydraulic ram. A large back frame incorporated to accommodate brackets to fit any material handler. Either arm can be locked allowing just one arm to move. The clamping distance can be adjusted to requirements. 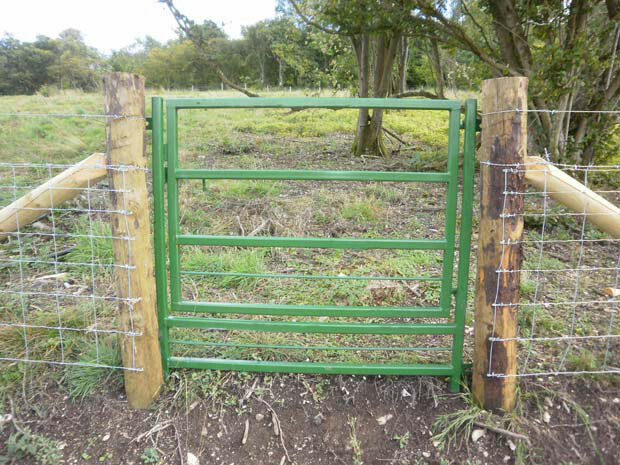 Parkland, Estate and Keeper's gates are manufactured to clients specifications, and to blend into their environment as pleasingly as possible. 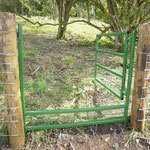 Keepers/ramblers Gates: These gates are wide enough for horses to pass through. New design and powder coated. The Scrag is a dual purpose machine which is ideal for general purpose ground clearance and preparation. Available from 1.5 metres with 0.5 metre increments in width with 9 inch (230mm) tines, to fit any mini-digger form 750kg- 5 ton operating weight, protruding tine length 6 inches. Scrag 2 is a heavy duty version with a starting width of 2 metres with beefed up tines, a ripping back blade and sturdy brackets for diggers 5 ton and above, With 12 inch (305mm) tines. All the locks have been designed to provide a cost effective way to deter theft of these expensive machines. All have optional ground stakes for added security. Dig-a-Lock - has been designed to provide a steel drive in blade lock for any size digger. Once in the lock the machine cannot be moved forwards, backwards or the tracks turned sideways. Lock-a-Quad - Designed so the rider can drive into the lock and park-up. The hinged arm pivots clear away for easy access, but locks down over the seat, providing a ring of steel protection. A competitively priced deterrent from theft of these valuable machine. Lock-a-Mower - provides a safe and cost effective deterrent against theft of your ride on mowers. 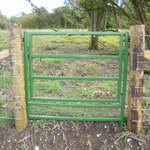 Chalke Valley Enineering can also produce to order special metalwork pieces for a farm or homestead. We have the ability to hyper accurately laser cut steel of substantial thickness from 3d computer based patterns. We can weld steel very accurately and finish a piece to a standard so fine that customers are constantly amazed at the precision of it. We also have the ability to powder coat a steel item such that it has a bright uniform colour finish that is hard wearing and totally water and rust proof. With such resources at our disposal we feel confident we can design and build bespoke metalwork items with a quality to exceed your expectations of finish and overall quality. Why not call us to discuss your custom made precision metalwork needs. we know it's a bit of a handful to type in.